Senator Obama is asked about smear emails at the MSNBC Debate (Jan. 15, 2008). Jewish Senators condemn religious-based attacks. In an open letter to the Jewish community, seven Jewish U.S. senators, all of whom have not endorsed a candidate for the Democratic presidential nomination, today condemned anonymous mass emails apparently sent to the Jewish community that use falsehood and innuendo about Senator Barack Obama's religion and attack him personally. The letter was signed by Sens. Carl Levin (D-MI), Barbara Boxer (D-CA), Ben. Cardin (D-MD), Russ Feingold (D-WI), Frank Lautenberg (D-NJ), Bernie Sanders (I-VT), and Ron Wyden (D-OR). Major Jewish institutions concurred with this sentiment in their own Open Letter to the Jewish Community including the UJC, ADL, AJC, Simon Wiesenthal Central, NCJW and Orthodx and Reformed Jewish organizations. The malicious email claimed that Obama was only pretending to be Christian and would hand over control of the White House to al-Qaeda. This email builds upon an earlier hoax email which suggested "that U.S. Sen. Barack Obama (D-IL) attended a fundamentalist Muslim religious school, known as a madrassa, as a child living in Indonesia, and that his childhood education was steeped in radical Islam. In fact, from ages 6 through 10, he attended a public school in Indonesia with both Muslim and non-Muslim students. Sen. Obama is not a Muslim; he is a Christian who attends the United Church of Christ." Obama is an outspoken critic of anti-Semitism whereever it occurs. Most recently, he criticized his own church's minister Rev. Jeremiah A. Wright, Jr. for honoring Louis Farrakhan despite Farrakhan's repeated hateful statements about Jews. 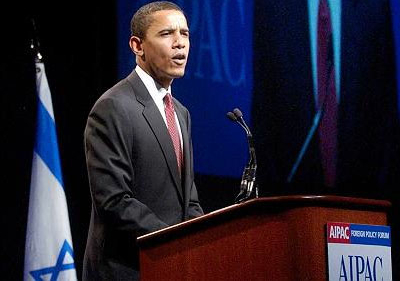 Senator Barack Obama speaks at AIPAC meeting. Over the past several weeks, many in the Jewish community have received hateful emails that use falsehood and innuendo about Senator Barack Obama's religion and attack him personally. As Jewish United States Senators who have not endorsed a candidate for the Democratic nomination, we condemn these scurrilous attacks. We find it particularly abhorrent thai these attacks are apparently being sent specifically to the Jewish Community. Jews, who have historically been the target of such attacks, should be the first to reject these tactics. We won't dignify these falsehoods by repeating them in order to refute them. Instead, we will express our outrage at these tactics, which are being used to demonize a good and decent man and our friend and colleague. Attempting to manipulate voters into supporting or opposing one candidate or another based on despicable and fictitious attacks is disgraceful. These false and malicious attacks should not be part of our political discourse. All voters should support whichever candidate they believe would make the best president. We sincerely hope that Americans will make that decision based on the factual records of these candidates, not false charges circulated by anonymous mass emails. Signed by Sens. Carl Levin (D-MI), Barbara Boxer (D-CA), Ben. Cardin (D-MD), Russ Feingold (D-WI), Frank Lautenberg (D-NJ), Bernie Sanders (I-VT), and Ron Wyden (D-OR). PBS tracks down these smear emails. As leaders of the Jewish community, none of whose organizations will endorse or oppose any candidate for President, we feel compelled to speak out against certain rhetoric and tactics in the current campaign that we find particularly abhorrent. Of particular concern, over the past several weeks, many in our community have received hateful emails that use falsehood and innuendo to mischaracterize Senator Barack Obama's religious beliefs and who he is as a person. These tactics attempt to drive a wedge between our community and a presidential candidate based on despicable and false attacks and innuendo based on religion. We reject these efforts to manipulate members of our community into supporting or opposing candidates. Attempts of this sort to mislead and inflame voters should not be part of our political discourse and should be rebuffed by all who believe in our democracy. Jewish voters, like all voters, should support whichever candidate they believe would make the best president. We urge everyone to make that decision based on the factual records of these candidates, and nothing less. Editor's Note: The Obama campaign has had so many rumors to quash that they have added the create a new website specifically to deal with the sheer volume of false claims.